On July 5th Robots in Architecture held a one-day-only robot workshop at the CAAD Futures 2011 conference. We really had to compress many topics into a single day…with a long lunch break! Fortunately, we had really enthusiastic participants (Thank you Aurelie, Chengyu, Daniel, Dermott, Emmanouil, Juan Manuel, Pankaja, Peter, Rivka, and Sebastian!) and had a great time going from parametric design to direct robotic fabrication in just a few hours. 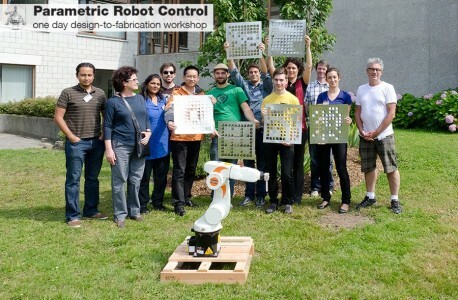 For the design of parametric shading panels we prepared aluminium sheets for each participant and then used our KUKA robot to parametrically punch the individual patterns into the material – while this may sound simple, many factors such as toolpath layout, reachability, geometry, design and kinematics had to be considered. We’ve uploaded the workshop material and prepared a short video of the workshop that also showcases the capabilities of our upcoming KUKA|prc component for Grasshopper – enjoy! We want to thank our workshop participants, our hosts at Lucid ULg Liège and KUKA CEE for making this workshop possible! At the conference Advances in Architectural Geometry 2010 in Vienna we hosted a two-days weekend workshop dealing with using Grasshopper for robot milling. We were very happy to have a wide range of participants, ranging from high-end offices like Snohetta and HdM to researchers from many international universities. The course material is posted below – a PDF with the instructions, a main 3DM file and the GHX Grasshopper definition.